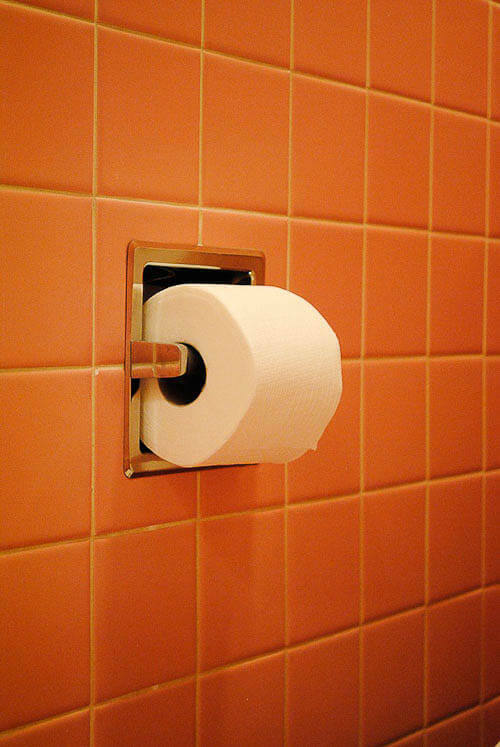 So here is our bathroom story…. We decided to leave the bathrooms alone as we tackled the rest of the house. We were just not sure what to do with them. 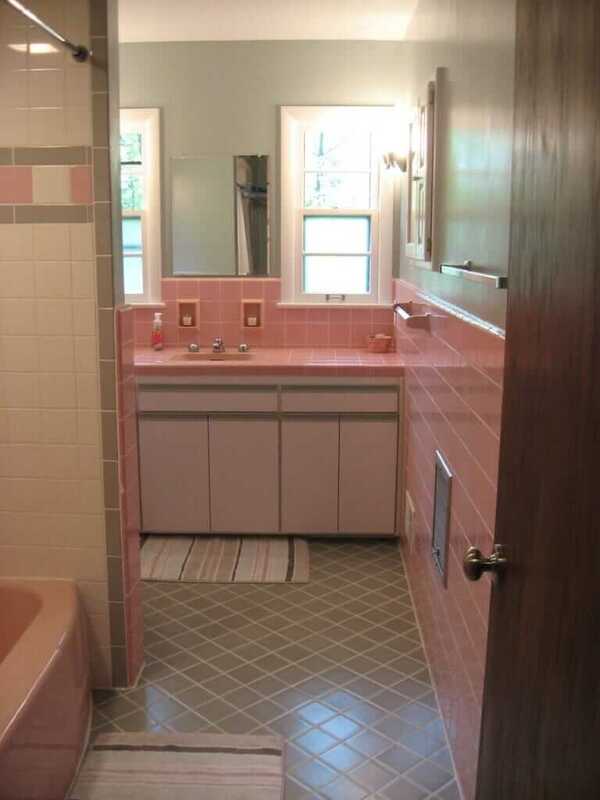 We had no idea how to work with all that pink. But not too long after moving in, a loose piece of wallpaper got the better of me and I just could not resist reaching up and peeling it off… and I was off to the races with no real plan on what to do. 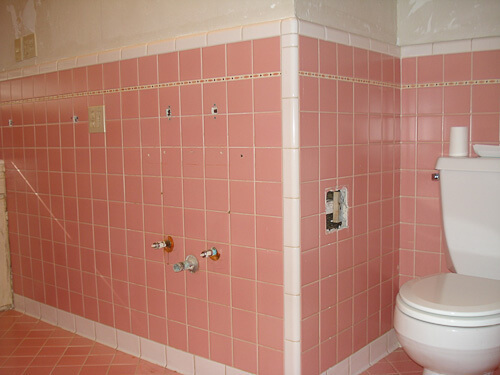 We went back and forth on just gutting the whole thing, but I thought there must be a way to work with this all this pink. 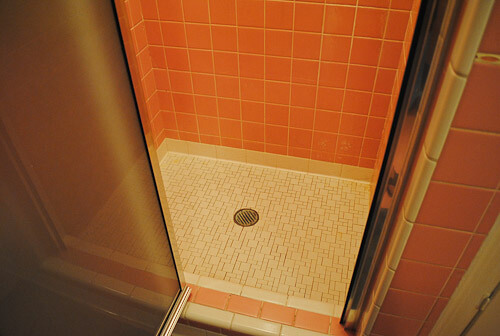 The tile seemed to be in good shape and I just could not bring myself to tear out one of the only original features left in the house. 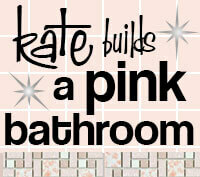 That was when I came across the “Save The Pink Bathrooms” site and Retrorenovation.com. I quickly saw some cool examples of pink bathrooms, ideas from others, and a plan started to form on how we could make it our own. Suddenly, pink was kinda cool. I certainly understand what you are saying about the “before”. To each their own. 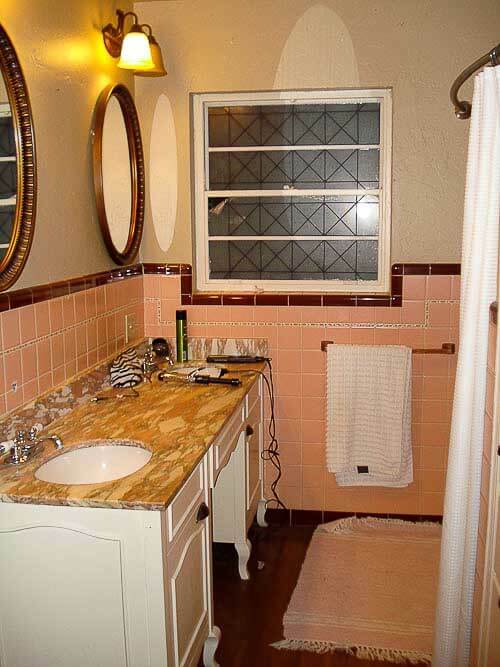 The entire house was similar to the bathroom. I guess what I would call french country cottage? Although not our style, it was very well done and I appreciated all the effort and attention to detail the previous owners put into the house. 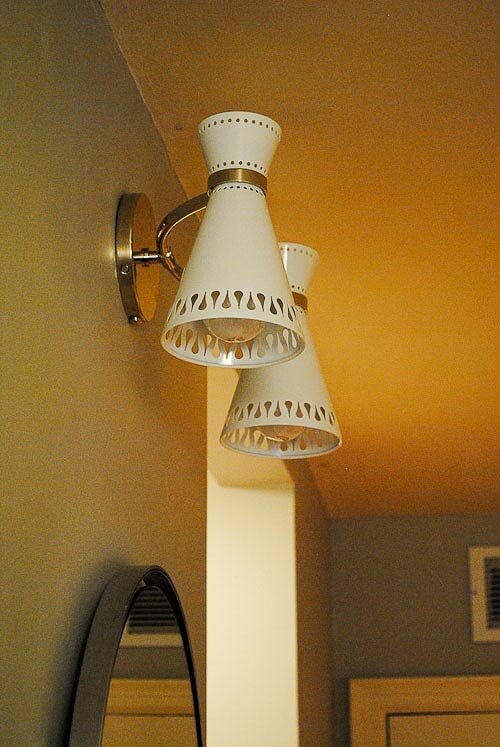 it was owned by a young couple, similar to us, and they had spent the previous 3-4 years redoing the whole house, and then we went in and re-did it all over again lol…. so this house has gotten a lot of attention the last 10yrs, it probably has an identity crisis at this point :). 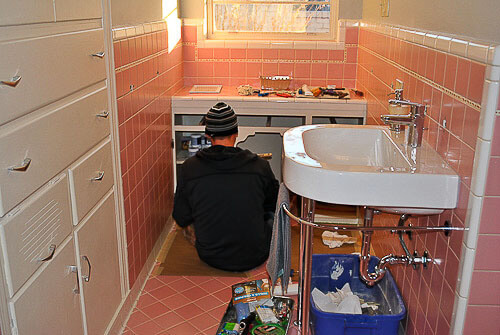 By far, the two biggest projects were renovating the floor and the built-in vanity. 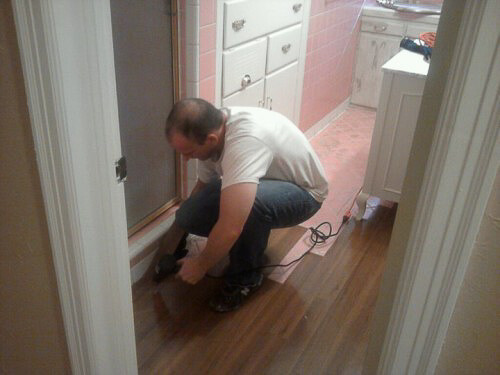 The floor had been completely covered with a faux wood stick down linoleum. Who knows how long it had been there or what I would find under it. 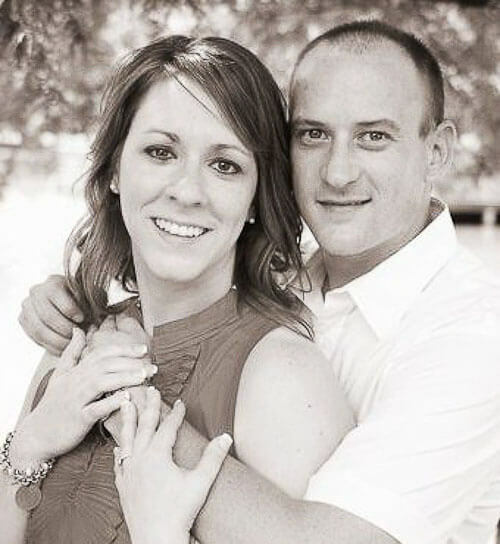 It was a painstaking process using a heat gun and putty knife to pull it up inch by inch. Once it was up, the thick glue left behind had to be scrapped off with a razor blade and the tile scrubbed with “goo off” over and over a again. I have well over 50 hours into that floor. 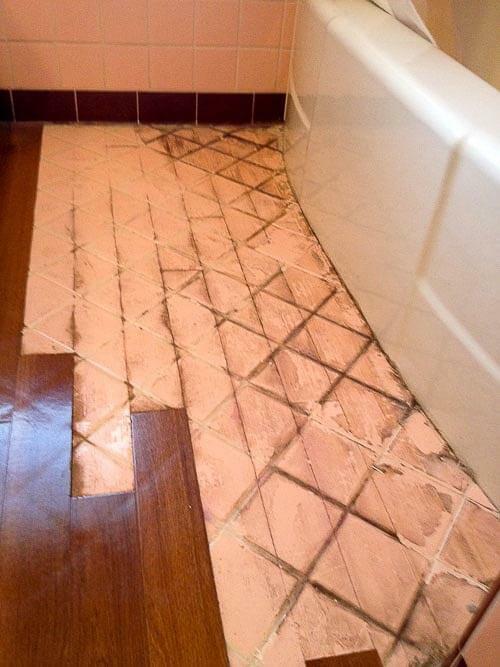 Amazingly it turned out great and luckily ran into very few cracks or damaged tiles. The built in vanity had been given some sort of special paint/epoxy treatment to make it look like old crackled wood. Not really sure what that was about or what it exactly was, but it definitely could not be painted over. 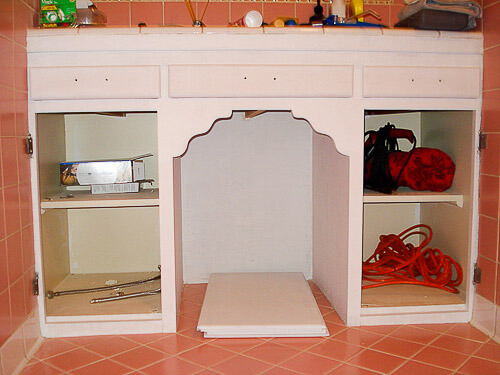 Hours were spent scraping off of every nook and cranny, filling damaged spots, sanded, and painted. Then, on to removing the wallpaper…. 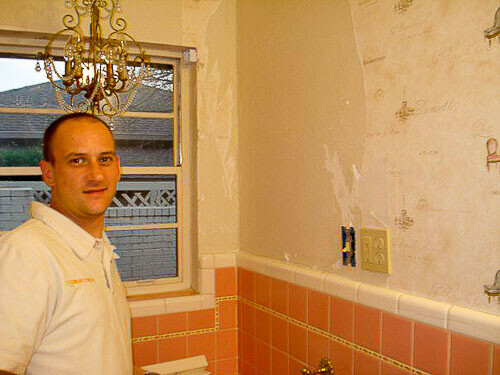 After it was removed, the walls had to be skim coated, primed, and painted. 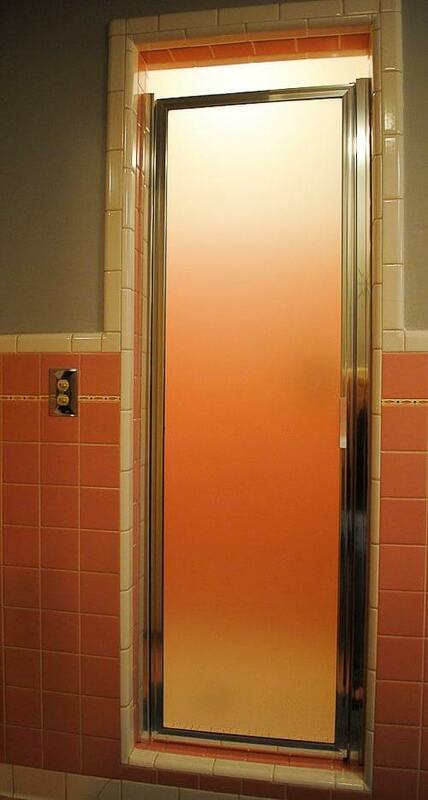 Shower door looked to be a replacement from the 80’s and showing signs of rust. Took a while to find a new one in a appropriate style, size, and reasonable price. 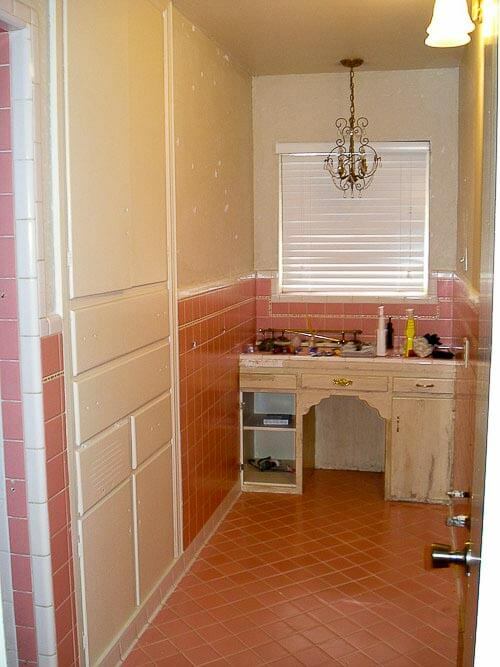 The sink and cabinet had seen better days and took up too much floor space in this narrow bathroom. 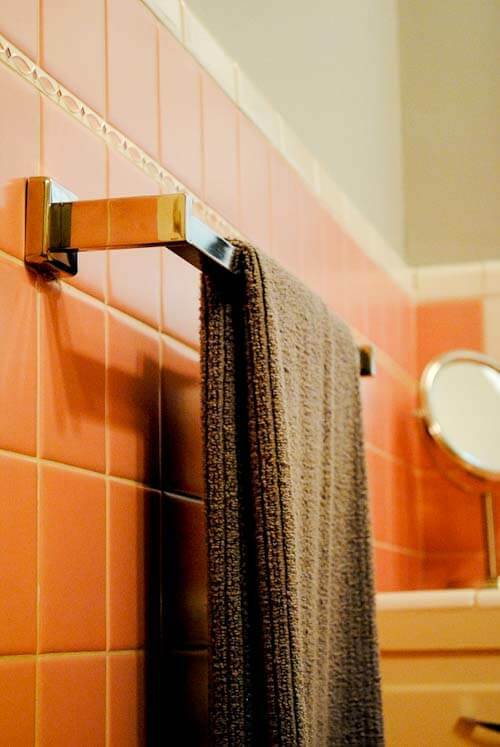 We wanted to do the bathroom in a twist of vintage and new modern, so the wall mount sink from Duravit with the chrome legs was a good fit and a reasonable price. 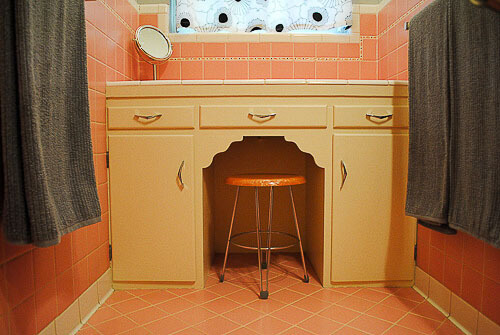 I could also tell a wall-mount sink with legs had been there originally because of the old mounting points on the walls and two spots on the tile floor where the legs would have rested. 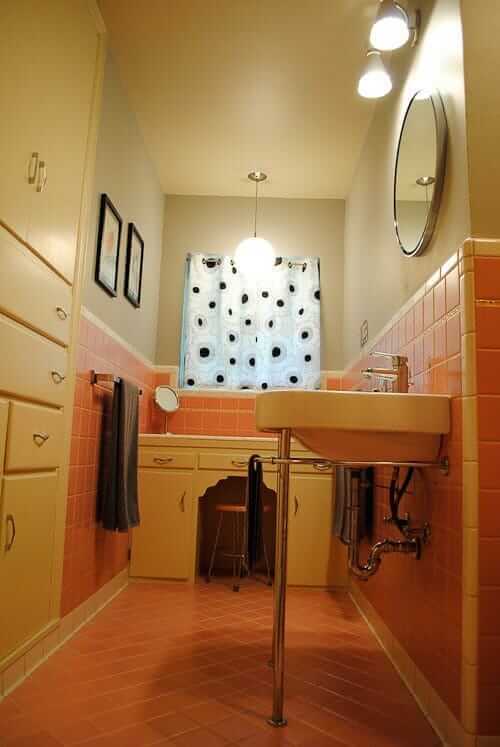 The chrome legs on the sink led to doing matching finishes in chrome on the boomerang hardware, towel bars, recessed toilet paper holder, recessed soap holder in the shower, and outlet covers. 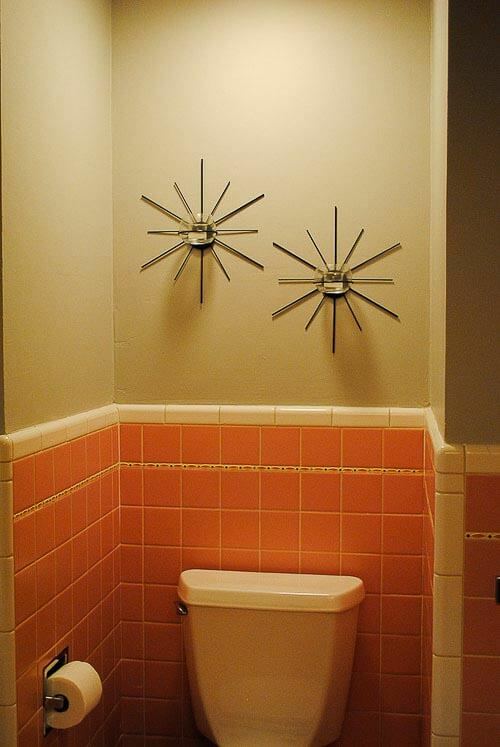 A few finds from etsy on the vanity stool, art for the wall, and candle holders over the toilet rounded things off. 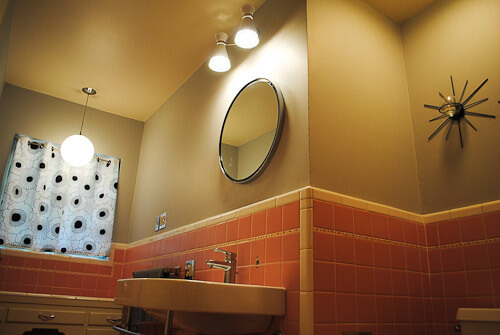 The light above the sink took forever to decide on. Have had three different lights there and finally rested on what we have now. 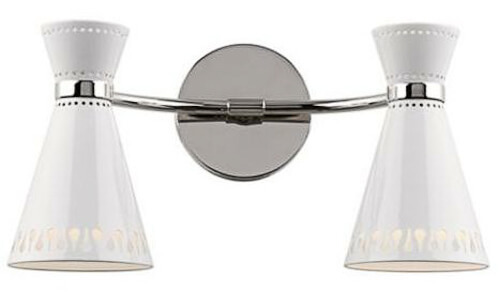 Really wanted to do sconces on either side of the mirror, but that would have meant bringing in a electrician. In total we spent about $2K. Hardware: Rejuvenation boomerang drawer pulls. 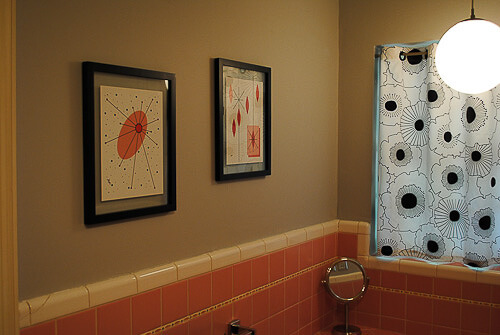 Shower door: Basco from The Shower Door Store. Sink: Duravit Happy D wall mount sink with chrome legs. Don’t recall where it was purchased, but was around $500 shipped. Prints: Seller/artist on etsy.com — Tonya Newton, Gamma Gamma Hey — that I have bought a few prints from for the house. 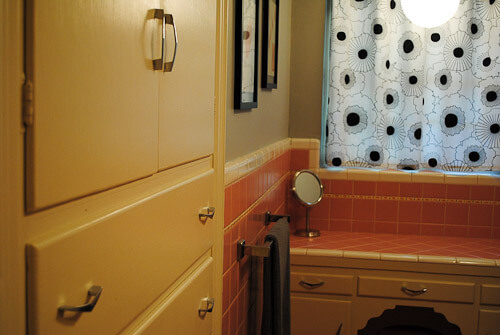 What’s your paint color scheme on the walls, vanity and cabinet? 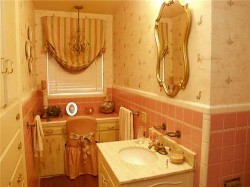 The colors balance with the tiles so beautifully! 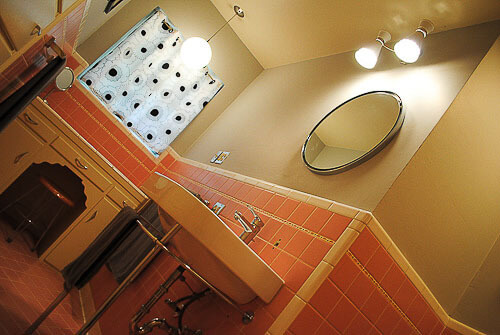 We’re just beginning our search to replace our pink-tiled 1949 bathroom’s over-the-top yet period multi-colored floral wallpaper (kinda Dorothy Draperish, so I’m living with it for now), and I love the colors you’ve chosen. 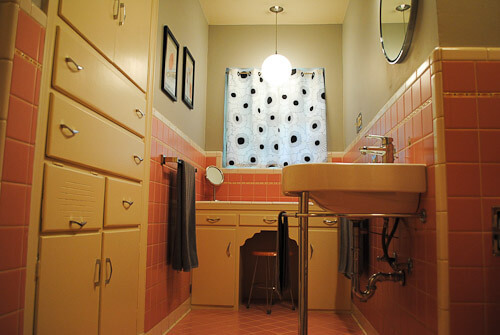 We’ve got the original Crane console sink, toilet and tub, plus a glam built-in vanity, but want to go for a bit more elegant and polished look, either with paint or wallpaper or a combination. Thanks for the inspiration! Adore the site, too. Is that the original floor? 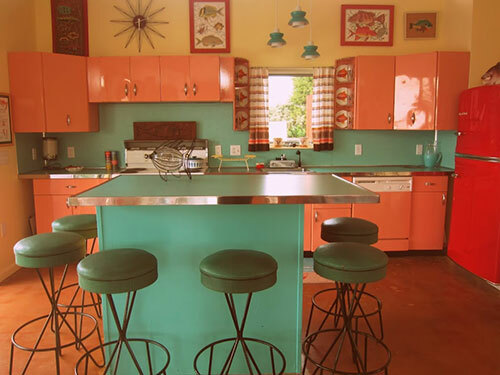 I have a 60’s ranch style home with a bath with pink sink/tub and turquoise floor to half-way up wall tile. 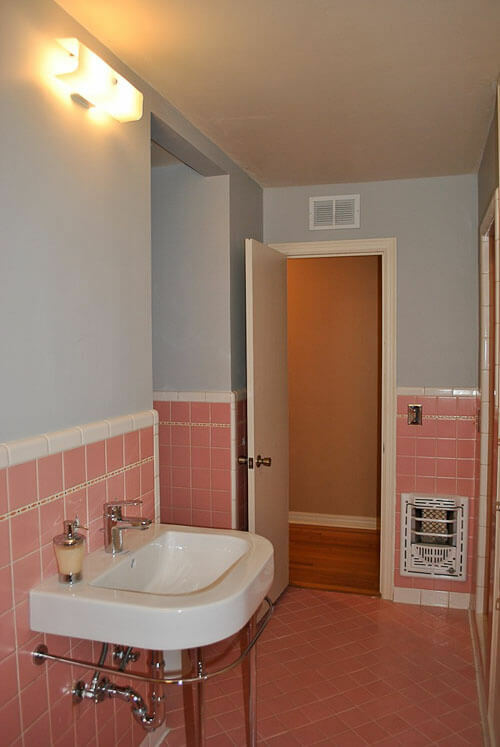 Trying to decide what to do with floor which previous owner put in… a white tile floor that doesn’t seem to work.